Progress at the site – 5040 Santa Monica Ave. All photos by Frank Gormlie unless otherwise accredited. Here’s updates on a couple of construction projects currently in progress in Ocean Beach. They include a mixed-use project on the 5000 block of Saratoga Avenue and 2 residential units on the 5100 block of Brighton Avenue. The OB Rag has been covering this project at 5040 Santa Monica Saratoga Ave. for some time. It includes the construction of a 2-story commercial unit in front and 4 residential units behind and above the front unit. It was approved by the Ocean Beach Planning Board over 2 and a half years ago, by a vote of 7 to 2 on July 1, 2015. 5040 Santa Monica Ave – artist rendering. And according to local OB historian, Kathy Blavatt, the site was the last sand dune in Ocean Beach. The project proposed for 5040 Santa Monica was a scaled-down version of a development that had been approved back in 2006 but never constructed. The developer was going for a ‘substantial compliance review’ with the city, as the site has been dormant for around 10 years. The lot supposedly contains “the last sand dune in OB”. The new design includes one 2-story commercial unit in front and 4 residential units behind and above it. As that block of Santa Monica is zoned as a mix of commercial and residential, it was incumbent on the developer to install some commercial. The commercial parking – as is all the parking – is in the back and off the alley. Twelve parking spaces are planned. The residential units will be eventually turned into condos, the owner said. View of front of construction. After all discussion, the Project Review Committee voted 6 to 2 to recommend approval to the full Board. View of site from alley. • John – Reported that the Project Review Committee voted 7-2 in support of the project. • Leo Sullivan (Developer) Provided a summary of the project. Noted that it was approved previously by the Board, in much larger version, several years ago. from underground to surface, units decreased in size, units split east-west instead of north -south to allow more light/ventilation). o Allowed Floor Area Ratio (FAR) of 2.0 (~14,000 sqft) in CC-4-2 commercial zone. Proposed project is now 1.20 (~8,500 sqft). o Includes 1, 150 sqft commercial space fronting Santa Monica Ave.
Valerie –Expressed concerns regarding bulk and mass with respect to to Community Plan. Craig – Expressed support for project, believes it is appropriate for commercial zone. John – Believes project is ultimately incongruent with Community Plan due to its bulk/mass from the street and its scale relative to the neighboring properties. Jane – Expressed support for the project, believes it is congruent with Community Plan for a commercial zone. • Craig moves to recommend approval of the project as presented, seconded by Jane. o Motion passes, 7-2- 0. 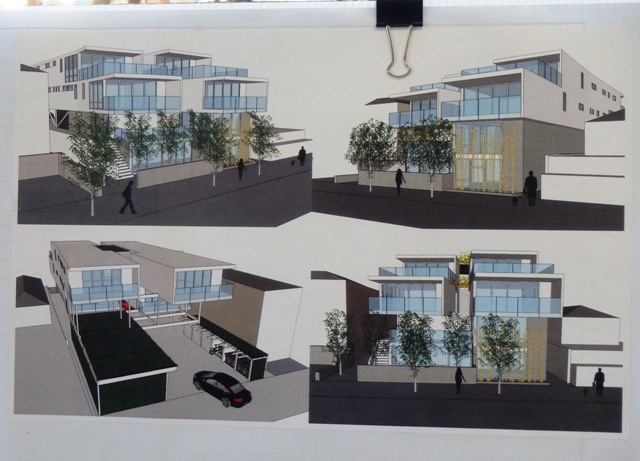 Two 2-story single family units are being built at 5109 – 5109 Brighton Avenue in northwest Ocean Beach. The project is on 2 lots, 25 by 105 feet, as there is no alley on that block. The buildings’ elevations are supposed to be several feet below the 30-foot height limit. The original plans as presented to the OB Planning Board call for a subterranean garage to be built only several feet below the street level (the lots have a slight elevation from the street). And the 2 stories would be above them. On September 7, 2016 the project was presented to the OBPB and after some discussion was approved by a Board vote of 7 to 3 in favor. Two cottages were demolished for the new houses. Front cottage at 5109-11 Brighton Ave.
By building the garage underground – or in this case, slightly underground, the builder is able to calculate that stubborn FAR (floor area ratio) without having to use the square footage of the garage – which allows a smaller FAR. So, in this case, with the garages underground, the FAR is below 0.70 – OB’s main number – and with the garages included, the FAR is over 0.8. [OBPB Chair] Ambert took up the issue and asked Carmichael why was the garage so low if the roofline was below 30 feet high. Her answer was that that made a better “interaction” with the street and pedestrians, etc. Ambert didn’t accept this and made his own point about builders getting around the FAR by installing subterranean garages. Chris F., the owner, was present in the audience, and he added that the project “has support from neighbors”, and in fact, he’d gotten a couple there to support his project. One of the issues was whether the garages would flood – as the owner had only possessed the units for a one and half years – and [Board member] Craig Klein kept reiterating the flooding history of coastal OB. But the couple brought to the meeting by the owner insisted that they’ve lived on that block for 30 years and that block never floods – as it is on a slight rise. Chris, the owner, pledged to the Board the new units “won’t be vacation rentals”, that he plans to sell them when completed. He had built 4 units across the street years ago, and claimed to have “built dozens” of units. Most of the rest of the Board liked the design, with Jane Gawronski calling them “the cottages of the 21st century.” A couple Board members complained that the units would be out of reach for them, and they’re watching OB change into a community that they can not afford, even though they were born and raised in the community. There was more discussion, but by the end, the Board voted 7 to 3 in favor of the project. Ambert, Tom G, and Marissa Spata voted against. This article has three different addresses. 5040 Saratoga and 5042 Santa Monica, and then 5109 Brighton. Confusing as to what’s going in on Saratoga and/or Santa Monica. Catsmom – you’re so right! The correct address for the first project in the article is 5040 Santa Monica. The only thing I can come with is a brain fart. Thanks for giving us the heads-up.